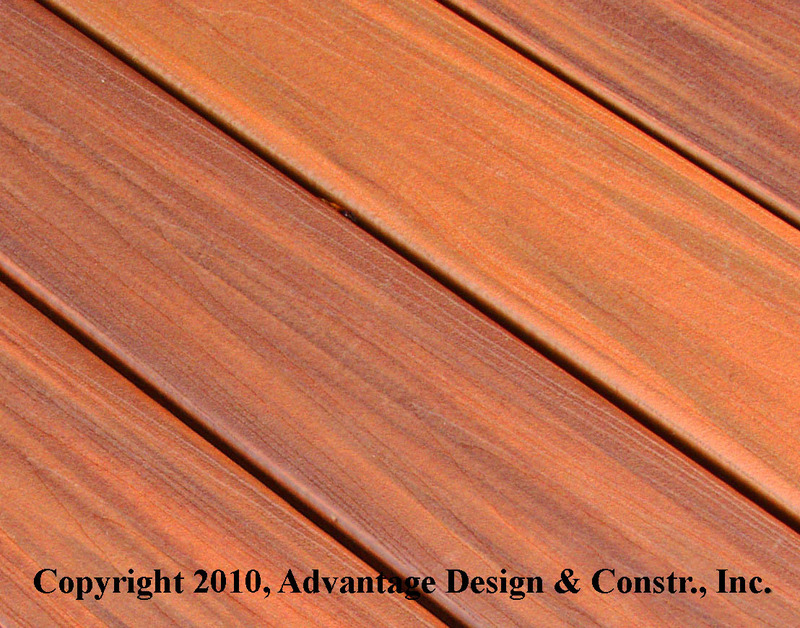 We are custom deck designers, and our clients often ask us how “that composite decking” compares to wood. Wood has been the standard for decks since…, well, since the first deck was built. It’s moderately hard, it’s durable, and it’s attractive. Until it fades. Then wood looks old and tired. You can treat it with a preservative to add color and to block out the harsh sun for a while, but the sun is strong and, it is relentless. It will bleach your deck grey. You must re-treat your deck every year to restore its color and to extend its life. Re-treating a deck is w o r k — at least a day of work for a mid-sized wood deck, and more for larger decks. For a full explanation of what re-treating a Pressure Treated wood deck entails, see Feeling Pressured to Treat your Pressure Treated deck? or to learn about protecting a hardwood deck, see Eight Tips for Maintaining your Mahogany Deck. Well, most people do not want to burn up their leisure time treating a deck. How about a low maintenance material for a deck? How about plastic? You know plastic: it is that unbreakable replacement for dinner plates, it is a light-weight replacement for car bumpers, it is a cheap replacement for silverware on picnics. Plastic will not rot, it can be fairly strong, and — here’s the big advantage for your deck — it does not need yearly maintenance. Sounds good, but how does it look on a deck? Truthfully: not great. When first introduced, it looked like…plastic, fake plastic. A poor imitation of genuine wood. Initially, the tradeoff between wood and artificial decking was Good Appearance vs. Low Maintenance — or, to be blunt, Genuine vs. Fake. Let’s review how synthetic decking progressed from ugly to attractive. In 1992, Trex® introduced the first low maintenance decking. (Actually, Trex touted it as “No Maintenance.” That was a costly mistake.¹) It was composed of plastic and wood fibers, and thus was called “composite.” Its surface was smooth and uniform; and it looked manufactured – because it was manufactured. Let’s call this the First Generation. Other companies, like Choicedek®, introduced competitive “low maintenance” decking. All these early composites faded significantly and were vulnerable to mold (like wood) – but they would not rot or splinter and did not require yearly staining. They were heavier and more dense than wood, and thus warmer under bare feet. Drop a steak on composite decking or spill red wine on it, and you’d see the stains for months. But that was not a competitive disadvantage, because wood too was vulnerable to food stains. Wood’s maintenance issue remained. Treating a wood deck can easily consume a full day every year, and Americans are increasingly jealous with their time, so composite decking slowly gained favor in the marketplace. Manufacturers improved their decking by adding grain and texture to composites, expanding color options, and developing ways to reduce fading. Low maintenance decking looked better, but still no one would mistake it for real wood. This was the Second Generation². Other improvements followed. FastenMaster® designed a screw that eliminated the ugly mushroom bump around normal deck screws. Companies like Correct Deck (now DuraLife®) and TimberTech® created grooved decking with hidden fasteners for a cleaner appearance. But composite decking was still composed of plastic and wood fibers – and those exposed wood fibers provided food for mold, especially when wet. Along came Procell. It abandoned the wood fibers in favor of all PVC plastic (with some flax fibers embedded for strength). Procell, now called Azek®, arrived initially in only grey and light brown, but soon new pastel colors were offered. To many people, it looks like well-painted wood. Beyond appearance, Azek’s best features are stain resistance, scratch resistance, and mold resistance. Food stains wash off easily; Azek even advertised photos of red wine spilled on its decking. Without wood fibers as a food source, this new decking fared much better against those blackish mold stains. Because Azek’s PVC is a weaker plastic than the polyurethane and polypropylene used by competitors, it does not offer the grooves on the edges for hidden clips. The only way to fasten Azek was with screws through the surface — until Fasten Master introduced Cortex® plugs that neatly cover each screw head. The plugs are cut from original Azek, so if you carefully align the grain, the plugs disappear. Can you find the 2 plugs in this close-up? Progress continued. Companies like TimberTech® and Fiberon® (and later, Trex) introduced random dark streaks to mimic the varying colors of real wood. This is the Third Generation of synthetic decking, and it looks more like real wood. What do you think? Ok, I cheated. Only the first two are synthetic. That last one is real wood. All these improvements kept increasing the price of low maintenance decking. In early 2009 several manufacturers combined new and old by putting an attractive, hard PVC plastic cap over a less expensive composite core. Called “cap stock”, this innovation offers the benefits of plastic decking at a lower cost. And cap stock is actually cooler underfoot that all-plastic decking , maybe because the composite core contains wood. Read more about deck temperatures in my article, “Just how Hot will Your Deck Get?”. Overall, the manufactured synthetics are more expensive than wood. Oh, there are some exceptions — a few exotic woods, like Ipe, cost more than older, second generation synthetics. True wood lovers will always prefer the genuine original, and they are willing to pay the cost of yearly treatments. But, if you like the looks of the new synthetics, the tradeoff disappears. You can have Good Looks and Low Maintenance. A final thought: How about a low maintenance deck made of wood? If this seems impossible, check out Low Maintenance Wood for your Deck. Update, fall 2014. Now here’s an impressive development: plastic decking made from photographs of real wood. A company called Zuri® covers a plastic core of decking with photographs of real wood and encapsulates the top with hard acrylic. Zuri is available in four colors: Walnut, Chestnut, Brazilia, and Weathered Grey. This photo fails to capture Zuri’s full beauty. It truly does look like real wood. The protective acrylic coating is thin, but it seems strong. Time and experience will tell us how durable Zuri decking is. Could this be the Fourth Generation of synthetic decking? In 2004 Trex settled a nation-wide class action lawsuit over product defects and their “No Maintenance” warranty vs. the need to clean mold. What is involved in that “Low Maintenance”? See No Maintenance, Low Maintenance, Mo’ Maintenance. I confess, these categories — 1st Generation, 2nd Generation, etc. — are my own creations. They carry no weight in the real world. We at Archadeck of Suburban Boston offer professional design and build services for clients west and north of Boston. Over the past 23 years we have designed and built over 800 projects. We have enhanced the depth of our expertise by limiting our work to decks, porches, sunrooms, and patios. To view some of these projects, visit our website. To learn how we treat our clients, check our ratings on Angie’s List or read an article about us in Remodeling Magazine. For a free design consultation and a relaxed and rewarding design and construction experience, contact us via e-mail, subboston@archadeck.net or by phone, 781-273-3500. © 2015 Advantage Design & Construction, Inc.
PreviousWhat is a Cantilever and Why would Your Deck want one? NextWhat is a Pergola and Why would your Deck want one?